But nobody seemed to warn you of what you might find. Music, madness, you see love in my eyes. Love? Not me, Lust is all I know. Love? Not you, I’ve long since let you go. Time running out. Freedom, it still flows. The chase is here to haunt me, discover all my lies. If you think you want me, look straight through my eyes. Lust for me, love will let you go. Love is still alive where lust no longer flows. Strangling our freedom, taking light out of our eyes. I just thought I would start with some poetry today. I haven’t written anything in a while, but it’s a good way to get honest feelings out of the deepest part of me. When I write poetry, I just sort of let thoughts and feelings come out, and then I try to make them rhyme. 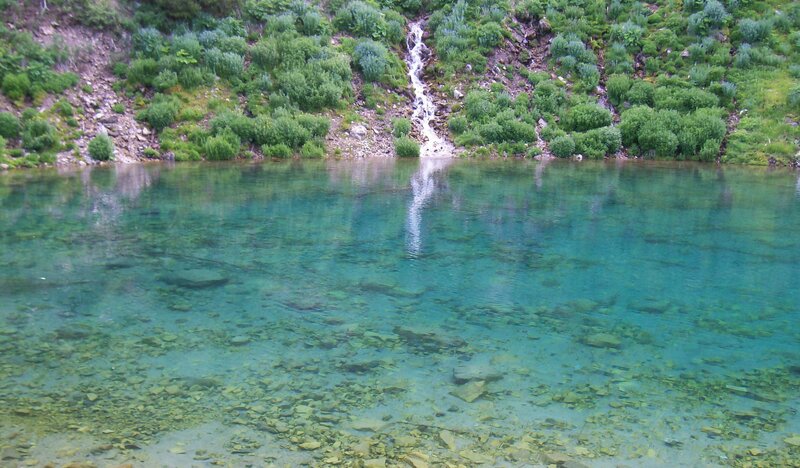 The photo is from last summer when I went up to Crystal Lake, the most beautiful place close to where I live. Every summer I have to wait until July before the snow is melted enough to drive up there, but I have to go directly after the snow leaves or the waterfalls won’t be running. It’s all about timing. This entry was posted in Art, Creative Writing, Daydreaming, Deep Thought, Nature, Photography, Poetry and tagged apple tree, crystal lake, lake photography, love, love poems, lust, mountain lake, philosophy, poetry, reflection, self awareness, snow, summer, waterfall. Bookmark the permalink.